It’s the art of being in control. Of having an efficient money system. Of knowing where your money is and how it’s doing. Budgeting is your ground base, your concrete foundation to managing your money well. It’s the bread and butter of personal finance. So what I’m trying to say: do a bloody budget. And being a college student, now is the best time to practice, make mistakes, and prepare for the future. As I said before, a budget is a plan. A plan to see where your money is coming in, where it’s going out, where it should be going out and where you would like it to go out. 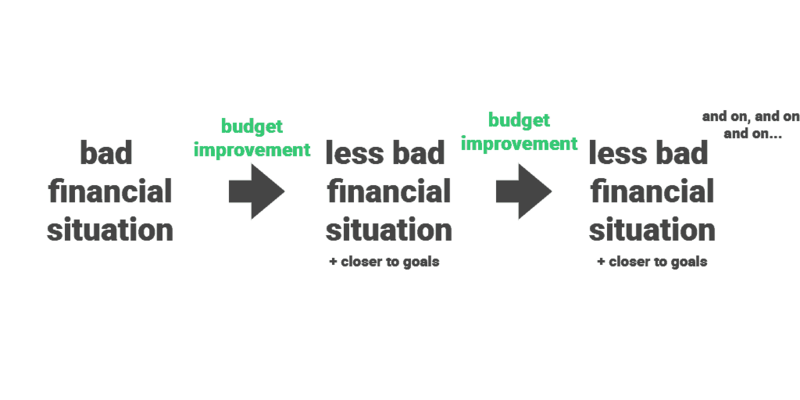 Think of a budget as a flow chart of improvement. At first you see you’re in a bad financial situation. Your budget plan says your income and expenses aren’t looking too good. You analyse and see what you need to improve on. Then you re adjust, you track how you’re doing and you set your goals. Your budget will never be perfect, but it will be a little better each time. And every time you do this, you get closer to your goals. A budget is a constant readjustment of your finances in order to reach your goals. And who doesn’t want to reach their goals? All you need is a pen, paper and calculator. Prepares you for the future: larger expenses, important debt, etc. And guess what? Money is everywhere. No matter whether you want to become a scientist, a plumber or an astronaut, money will always be involved in your life. You may hate it, you may curse it and you may have a fit every time you see cash. But you’ll still have to use those damn pounds and pennies. So why not make sure you’re using them right? A budget lets you put your money on autopilot: no more worrying if I’m saving enough, no more ‘did I spend too much?’, no more ‘will I get to the end of this month?’. Nope, because your budget will tell you where to put your money and how much you can spend. And trust me, this makes sleeping at night so much easier. 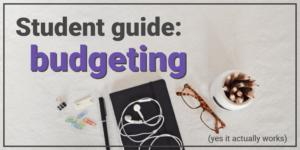 I’ve been blabbing on about how amazing budgets are for quite some time now, so it’s time to get started with the nitty gritty. Apologies if you’ve already taken the 6 day email course – I will be using the exact same examples and structure. 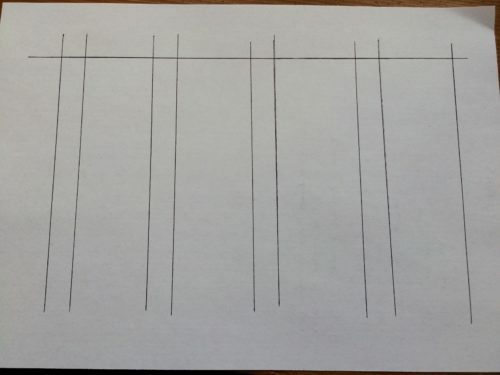 So it’s very simple – get a nice big piece of A4 paper, a pen and a calculator (maybe even a ruler if you’re a perfectionist). 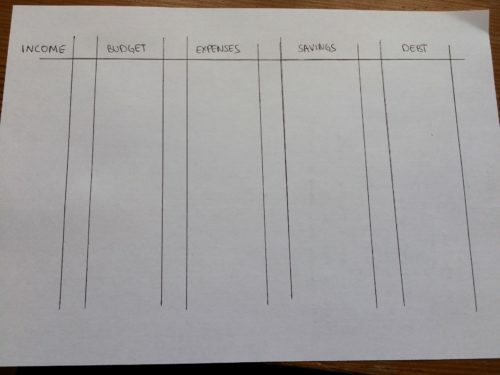 Then fill these out with the following: Income, Budget, Expenses, Savings and Debt. Then, very simple: slot in your income every month and then your expenses. Have no idea where your money goes each month? Do a rough estimate – check your bank account or try tracking for a week, see what happens. 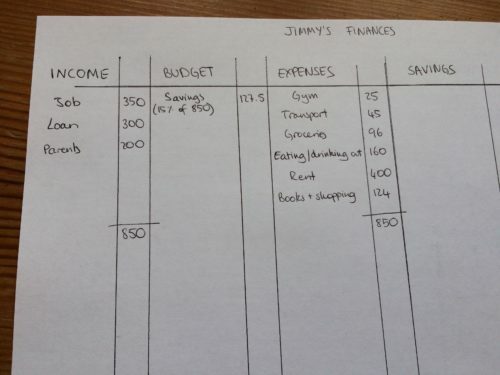 Below we have Jimmy’s expenses (he loves takeaway). Everyone’s budget will look differently. Maybe you have irregular income, maybe you have a credit card and like overspending every month (not good!) or maybe you have some expenses that don’t happen exactly every month. For this reason I always like to start with a piece of paper – write down whatever you feel is necessary. Add extra columns, strange signs, whatever helps you understand what’s going on with the ££. 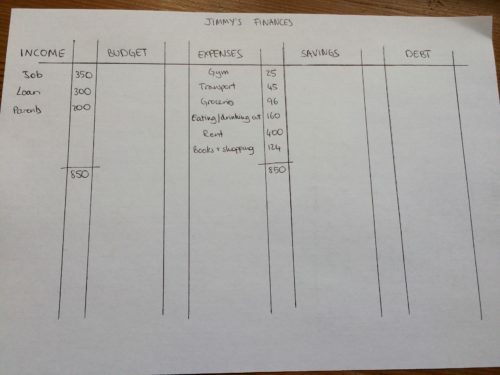 Calculate 15% of your total income and add it to the budget column as ‘Savings’. Lower expenses: Look for ways of decreasing your ‘mandatory expenses’: find ways to lower your rent, cut on transport and find some gym discounts. Cutting down the bills and essential expenses means more fun money – so do some research. Increase income: Now it’s important to note that as a college student, your priority is studying and making the most of university. If you feel you have time and are eager to earn some more, by all means go ahead and get a job, earn some passive income or start a side-hustle. But don’t feel pressured to do so. And feel free to increase that 15% savings rate. 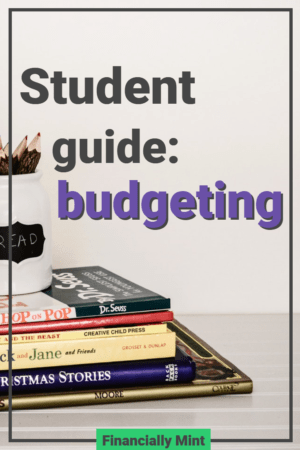 As a budgeting beginner in college, 15% is a good place to start, but the more you can do the better! The next column to tackle is debt. As a college student, you hopefully won’t have too many debts: student loans and maybe credit card debt. Student loans are a tricky subject, because you have to decide whether you want to pay them off or not. Credit card debt has to disappear for sure, the sooner the better. Second, read ‘Should I pay off my student loans?’. Then decide on whether you want to pay them off or not. If you don’t, no need to add anything else to the column. If you do, simply add on how much student loan debt you’ll have at graduation. Here are some websites to help you calculate the number: Complete University Guide calculator and Money Saving Expert calculator. 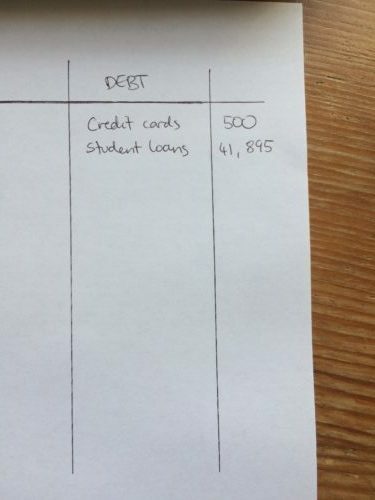 You now have a pretty clear picture of how much debt you owe. The next step is to tackle it and make a plan to pay it all off. 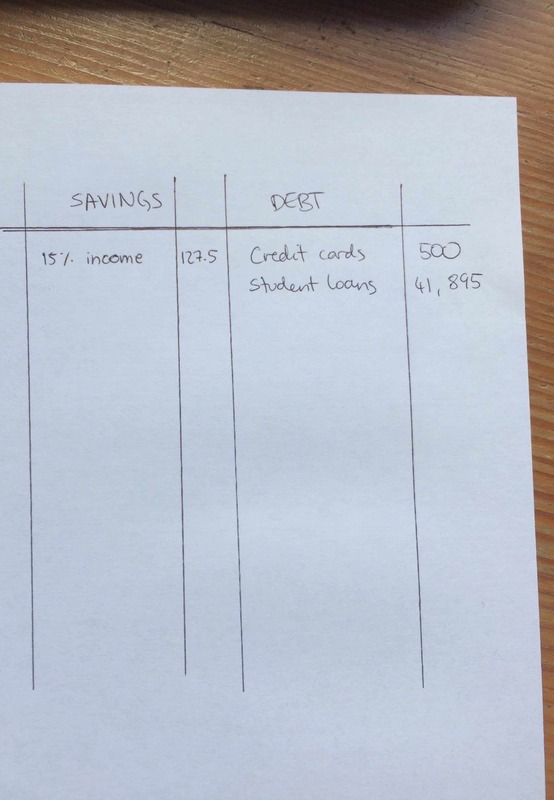 Write down all your savings + that 15% of your income. If you don’t have any savings, just put the 15%. 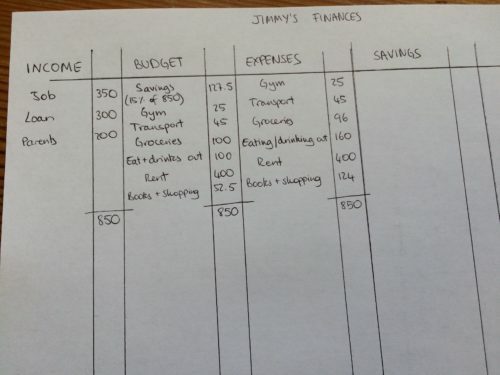 As you can see, Jimmy has £127.5 every month just for himself (from the 15% of his income). He has goals, he has debt and he also has responsibilities. He decides to allocate this amount to three things every month: Debt, emergencies and personal goals. He know he really has to pay off this high interest credit card debt. A quarter to buying his dream car. 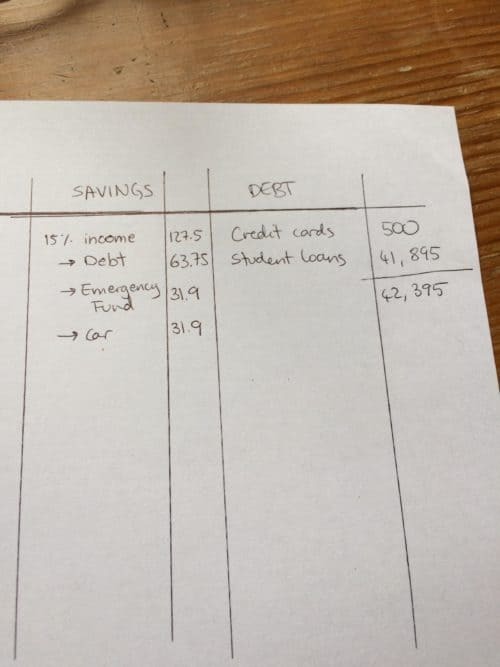 His 15% is truly working for him: getting him out of debt, preparing for emergencies and helping him get to his goals. And yes, at £30 a month it will take him a while to get that car. But once you get started remember that you can always increase that 15%, change around the numbers and find other ways to work towards your goal. Keep trying until you find what works best for you. 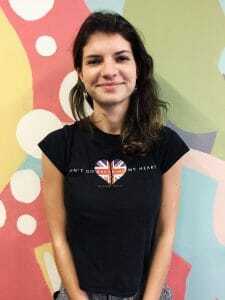 Why an Emergency Fund? I’m going to cover this in a future article, but it’s pretty obvious: emergencies happen, and you want to be prepared. As college students it’s recommended to have around 1- 2 months saved up into a separate bank account especially for emergencies. Jimmy knows this, and so wants to start building his Emergency Fund bit by bit. Every month those £31.88 are allocated to a separate bank account. I recommend setting those 15% apart the minute you get your loan/paycheck/allowance. At the end of the month, or whenever you get paid, take apart your 15% and make each part do its work for you. Save up for that car/trip/laptop, build up your emergency fund and starting paying off your debt. You’ll suddenly start to feel like everything is in order, everything fits. You know where your money is going and you know that it’s going in the right places. Everything is calm. You are becoming an efficient and responsible adult. Congratulations. You’ve done the planning and the forecasting, now it’s time to automate the process so that every month you can quickly and easily set your budget, keep track of expenses and keep working towards your goals. I keep track of day to day expenses with an app like Coinkeeper (check out Top Money Apps Every College Student Needs). The app also has my budget so I make sure I don’t overspend. Then, at the end of each month I add everything onto an Excel spreadsheet and calculate where my 15% should go. I also have a separate spreadsheet with all my bank accounts and investments, which I update regularly. I work out how much money I have to spend for the entire term and divide that by the number of days (as I’m living on campus it includes weekends) and it will give me how much I can spend per day. I will document how much I spend per day. At the end of every week I will see how much I am over/under and document that. At the end of term I’ll have a full summary. I work week by week. If one week I overspend then the next week I’ll be more cautious. My number one way to budget is using an app on my phone. The app I use is called Dollarbird and I like it because it’s laid out as a calendar and I’m able to add income/expenses by day. I can also see a monthly overview and this allows me to look at how much I spent during the month and what I spend it on. Using a budgeting app like this keeps me from overspending; plus, I always know where I spent that random $20 that I’m missing. I seperate my income into halves, making sure there’s at least 10 percent put into savings where the savings is halfed by investment and retirement. Also, when it comes to food, meal plans are your friend. It’s difficult, but to make things a bit easier, I suggest collecting recipes, seperating them into categories like chicken, beef, and pork. Vegetables must be either incorporated or side dishes, and must make up 60 percent of the dish (aside from being cheaper than meat, vegetables are an investment for your body). Once, that’s done, rotate the three meat for a month and estimate the costs of all ingredients – – better if you’re using an online grocery delivery because you can see the actual prices of the store while coming up with your dishes and it’s time saving, perfect for single parents and overworked peeps. Also, List. Lists are importants. I auto deposit into a “bills/house” checking account my monthly expenses + another for savings; the rest is gravy for add savings and day to day expenses. 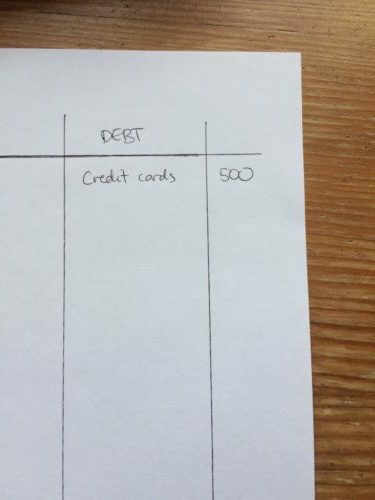 rent is always set aside first, then savings, recurring bills, minimum payments on cc debt and then I can assess what room I have to add to paying down debt. leaving extra for weekly pocket money/gas/groceries. So there you have it! Now it’s your turn to plan out your life. Trust me, it gets exciting.